The 33rd General Congregation of the Society of Jesus (September 1–October 25, 1983) was the first in Jesuit history to accept the resignation of a superior general. Pedro Arrupe had been elected superior general 18 years earlier by the delegates at the 31st General Congregation. On August 7, 1981, Arrupe suffered a debilitating stroke following extensive travels in Asia. It had been Arrupe’s desire for a year previously to resign his position as the order’s 28th superior general, a desire Arrupe postponed after a request by Pope John Paul II. After Arrupe became gravely ill, the pontiff appointed Paolo Dezza, a Jesuit priest, as a pontifical delegate to temporary run the Society of Jesus. Dezza summoned the general congregation for September 1, 1983, in part to accept Arrupe’s resignation and to elect his successor. The 220 delegates were named to participate in the 33rd General Congregation, which lasted for 55 days. On September 3, they voted to accept Arrupe’s resignation, and, ten days later, they elected Peter-Hans Kolvenbach as his successor. Kolvenbach had previously served as the provincial of the vice-province of the Near East. He was elected on the delegates’ first ballot of voting. The delegates also issued only six decrees–the fewest in the history of congregations. Decree 1 (“Companions of Jesus Sent into Today’s World“) was the delegates’ attempt, according to historian John Padberg, to draft single document “that would bring together the texts by individual commissions” appointed to consider a variety of topics. The wordcloud below represents the most used words in the six decrees, with a larger size denoting greater frequency. All the decrees are available the interactive chart below. Search the titles or categories or filter the display based on the same categories. Also available below are addresses delivered on behalf of Arrupe, remarks by Kolvenbach, and various communications between the Jesuit delegates and the Holy See. The full contents of all these documents, as well as the other Essential Documents, are searchable available through the Portal. They can each be browsed and downloaded individually. 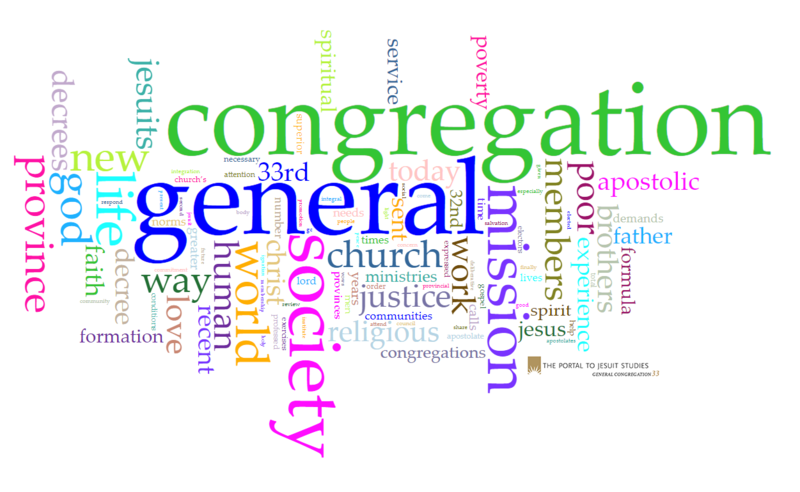 For more on the 33rd General Congregation of the Society of Jesus—especially on the important historical context for the gathering—please consult Jesuit Life & Mission Today: The Decrees & Accompanying Documents of the 31st–35th General Congregations of the Society of Jesus, ed. John W. Padberg (St. Louis, Mo. : Institute of Jesuit Sources, 2009).